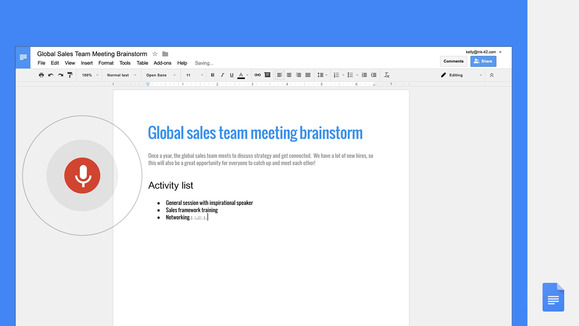 Last year, Google introduced a Voice Typing feature for the desktop Web version of Google Docs that allowed users to dictate their documents. It’s now getting upgraded to let people control formatting with voice commands as well. Using voice commands, people can select and format text, all without having to touch the keyboard. This is great news for people who already use the feature to transcribe their words. Google says the accuracy is improved by the work it’s already done with voice recognition in other applications. Now, that same technology is making it possible to do things like align text and even remove formatting altogether. Right now, the feature is only available through Google Docs when using Google’s Chrome browser on a desktop computer. But looking to the future, this feature could be a major boost to Docs’s editing capabilities on mobile. One of the biggest issues with writing a long document on a mobile device is that the keyboards on smartphones and tablets are usually awkward for extended use. Right now, people can use the system keyboards on iOS and Android to do dictation, but they don’t have support for the voice commands. What’s more, this feature has implications for accessibility in Google Docs. Using these tools, people who have limited use of a keyboard will be able to talk to their computer and type out documents more easily without using their hands. Google competes with several other players in the productivity application market, notable Microsoft, and a powerful voice typing feature in Docs could help Google to attract new users.